Do you think they'd let us do this in the parking lot of Hartsfield-Jackson? We arrived in Arica on Friday night and were quite surprised by the reception that we received. We knew that several of the pastors from the area and the president of Ubach (Baptist Union of Chile) would be receiving us, but I don’t think either of us realized just what that meant. Our plane arrived around eight and we headed down to the baggage claim to get our luggage. As I watched Blake get our bags off the belt and onto a cart, Marcelo walked up to me and gave me a big hug. Once we got everything together, we exited the baggage claim and were met by Mauricio Reyes (Ubach president), Sonia (president of the Arica pastors unions), and several church members that we knew from our visit back in January. After hugging all of their necks and kissing their cheeks, I figured that we’d probably go to a church somewhere, have some cake and that would be it. When we got out to the parking lot, there were several more people there to greet us. Then we noticed the couple in traditional Chilean clothing and the couple with a guitar and sound system. 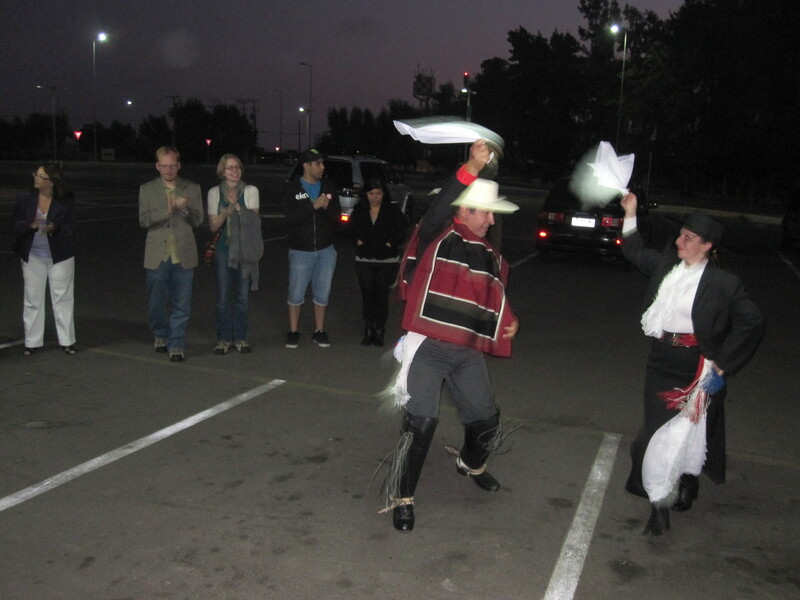 In the parking lot of the airport, they sang and did the dances to three traditional Chilean songs. It was quite the sight! I was grinning from ear to ear—I know that because I realized how bad my cheeks hurt once we’d gotten in the car. From the airport we went to Centro Misionero of Arica, Marcelo’s church, to drop off our bigger luggage items that we don’t need yet and to have some cake that one of the church members had made. I thought I remembered Viviana mentioning a reception including representatives from several area churches, and this one only had members of Centro Misionero, so I ate one piece of cake and tried to save room for more. Blake, on the other hand, was pressured into two pieces. From the mini-reception, we were taken to the First Baptist Church of Arica, closer to the city center. There were somewhere around 30-40 people waiting for us with a massive spread of food. Several people spoke and I was given a bouquet of flowers. We gave our greetings, although by 9:30 at night (after a bus ride from the coast to Santiago and a flight from there to Arica) our ability to think and speak Spanish was greatly diminished. I hope that our smiles and happy attitude drowned out our tiredness and muffled yawns. We met a lot of people at the reception. We met “young Marcelo,” a pastor from Santiago who has been in Arica for a little over a year pastoring a church that had been without a pastor for about six years. His wife and newborn baby still live in Santiago. We met a Brazilian missionary couple who have only been here for seven months. It is a little difficult to understand Spanish spoken with a Portuguese accent, but I think they’re really happy we’re here. He was so anxious to have us over for dinner, and she had to remind him that we just got here. We look forward to building a friendship with them. We met a lot of other people, as well, but I don’t think I have room to tell you about each of them. For those of you curious about the food a Chilean reception, here you go… There were several different kind of cake. We’ve learned that they call cake with icing “torta” and their pound cake type dry cakes are called “queque,” which is pronounced “kaykay.” Sound familiar? There were tons of olives. The olives here are more bitter/sour than the ones in Santiago, which is fine because that’s what we prefer. All of the ones I’ve seen so far have been black. There was also something like an apple turnover. It was cut into smaller pieces, so I have no idea how it looked beforehand. There were all mangyggner of store-bought cookies, from sugar wafers to Oreo-like sandwich cookies. As with any good celebration, there was hot tea, coffee, soda and homemade mango juice. Last night after church there was another reception, not much unlike the one I just described. I told Roxana that I know they’re Baptist by the food. I guess that’s true anywhere in the world. 3 Responses to What a reception! Wow!! This is so exciting!! And I cannot wait to share these stories in Spark!! Love you! !